Opposition leader Raffi Hovannisian, official runner-up challenging the results of the presidential election, continuing his “national enlistment campaign” in Armenia's north, is urging supporters to be at Liberty Square on April 9, at 11 a.m. – the appointed time of President Serzh Sargsyan’s second inauguration. “Armenia is in an incessant process; that day will bring a new situation, new approaches. Now, you have to decide whose citizens you are – of the Republic of Armenia or of the former president, former governor, chief of police, and I don’t know who else,” Hovannisian said during his Wednesday trip to Martuni, as part of his post-election stand-off. The Heritage party leader and his team have made trips to Abovyan, Nor Hach’n, Sevan, Martuni, Ijevan and Berd. In Abovyan, which in essence is under Prosperous Armenia Party’s (PAP) control, Hovannisian stated that the moment of truth for PAP was approaching and it had to decide which side it is on. PAP faction MP Vahan Babayan, commenting on this statements, told news.am local internet daily that PAP is an alternative, and that is where they see themselves. “What does it mean ‘the moment of truth for PAP is approaching’? That issue by itself is not proper, because PAP is working every day for the welfare of our country, to make it a better place, and our activities are transparently visible in the parliament, as well,” he said. In Berd, Hovannisian called upon Sargsyan to go and serve at the border together. “When they gave me an Armenian passport, I wrote a letter to the military committee; back then Kocharyan was running the office, and I opposed him because he was wrong. So I said that I had become a citizen and should be sent to the frontline to fulfill my duty before my motherland, but I was told I was out of that age. But I am telling you now, that if necessary, Mr Sargsyan, let us go together and serve at the border till the end of our lives, but set the people free,” he said. Parallel with the “national enlistment campaign”, a group of Gyumri residents will arrange a march from Gyumri’s Theatre Square to Yerevan’s Liberty Square to take part in the April-9 rally. “This is an act of protest to express our discontent with mass ballot-rigging and the official results of the February 18, 2013, presidential elections. Our goal is very clear: fight till justice wins. As they say “Justice gets sick, but never dies”. Heritage party vice-president Armen Martirosyan will accompany us throughout the march. This is a civil initiative done within the law,” says the press release of the initiative team. 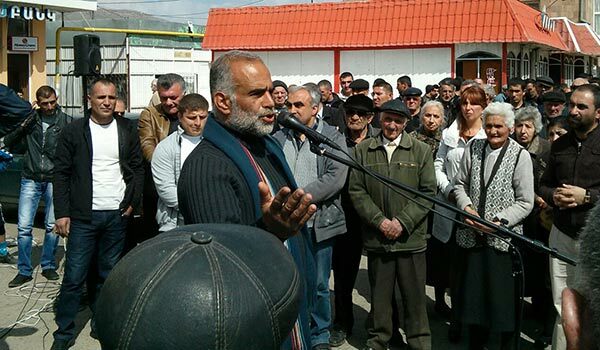 Gyumri's activists are urging residents of the settlements along Gyumri-Yerevan highway to join the march.